I’ve had so much response to the post “1961 Apache Chief Tent Camper” that I thought I should do one on the Apache Scout. Some years back Feral’s son Jake spotted a Scout for sale on the side of the road and told Feral, who bought it. 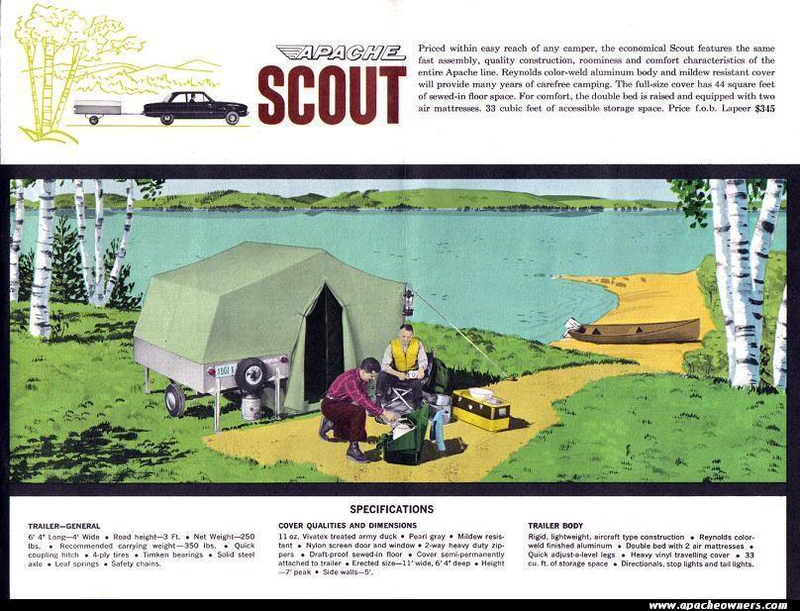 The Scout turned out to be a JC Higgens brand version made for Sears, but is identical to the Apache Scout. Sears sold camping and sporting goods equipment under the JC Higgens brand up until 1964 including campers, camp stoves, lanterns and coolers. Searching the internet I see the brand extended to fishing equipment including reels and tackle boxes. Most of it is collectible and considered vintage. So if you happen to find a JC Higgens camper you have the option to find other vintage items to go along with it – to me that adds value! Feral passed the Scout camper onto Jake who has been considering redoing the canvas, which is usable, though Feral used to throw a tarp over it if it looked like rain. The Scout is similar to the Apache Chief but takes a little longer to set up. It uses regular tent poles at the corners rather than the expanding interior pole system of the Chief. The door is on the side rather than the front as seen in the photo. It has the same floor space, bunk for sleeping, and compartment storage space. And coolness factor. You just don’t see these campers often. From what I have read, after the canvas dies a lot of people turn them in to utility trailers. That’s a shame but understandable. The boxes are made of aluminum so they never rust out. Here’s an original ad for the Apache Scout. $345 dollars. I guess that dates it! If you would like to see the post for the Apache Chief, including a similar ad, type chief in the search bar in the right column. Finished the restoration of my 61 Chief last Summer with the help of Gregory Canvas in Lapeer. Took it camping last Summer and had people stop by and ask about it all weekend. I even outfitted it with early 60’s Coleman, stove, heater, cooler, lantern and other vintage equipment as well. It is so light I pull it with my Ford Focus. 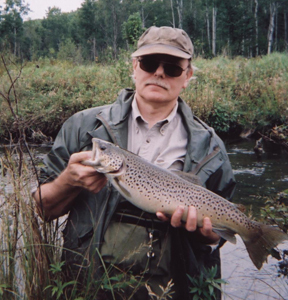 Hi Gary – I’ll pass the info along to Jake about Gregory Canvas in Lapeer. If you can tell us what it cost for new canvas, that would be helpful. Any information regarding canvass replacement would probably be of interest to readers, cost, turnaround time, how satisfied you were with the service. I have a Chief so I can appreciate what you are saying about people stopping by to ask about it. Great engineering and so practical! Howard – not sure about a chat but if I can answer a question let me know. Hope you have been putting you camper to good use. Our family of 6 kids and parents spent many a summer vacation in this Coleman tent camper including 6 weeks to California and back from Fort Wayne, Indiana in 1966. 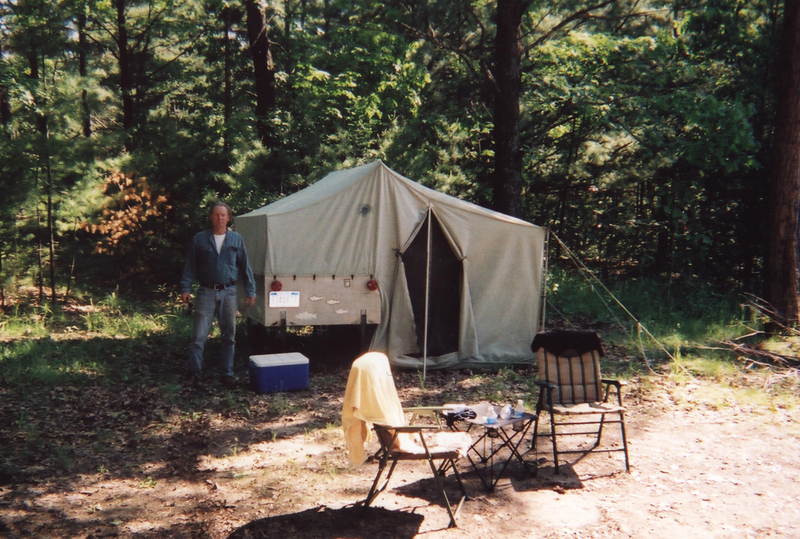 Dad would add a metal pipe covered by a huge tarp over the top away from the tent to create a tarped dining space with support poles and guy wires. All our clothes were packed into 8 hard sided totes Dad got from his work place. Station wagon and with no seat belts and styrofoam cooler loaded on the camper’s tongue was our fridge. Two doors I side the tent stores our clothes, and the 2 outside doors were for storing tools and the kitchen, Coleman gas pump stove, and gas lamp.